A warm late spring day in the capital greeted the intrepid gig goers as we alighted at Euston station. A Tube strike was also waiting for us but it had little effect on our afternoon as our chosen destinations were all on the Northern Line, largely unaffected by the downing of tools. 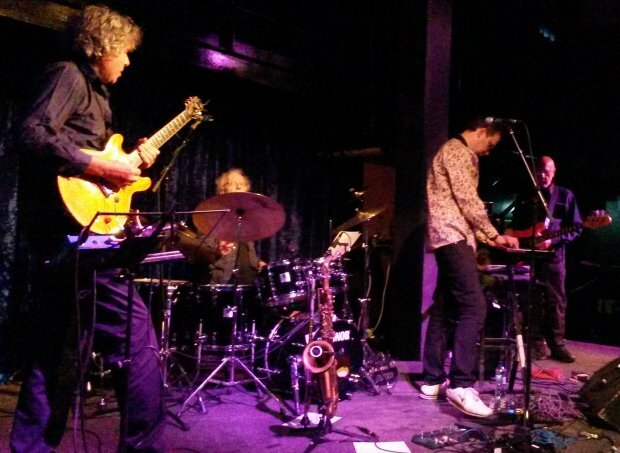 The Jazz Café in Camden Town is a venue combined with an eaterie, and the third time we have seen Soft Machine Legacy in similarly civilised surroundings in London in less than two years. The last time was a stellar performance at the Soho Pizza Express that ended with drummer John Marshall collapsing on stage, a worrying and sobering finale to the evening. It would have been churlish to have written a review of that gig, so I maintained a respectful silence. Thankfully in the six months that have passed since then, John has made a full recovery and tonight was to be only his second concert back in the fold. Also appearing on that fateful September night was the singular talent of Keith Tippett, who was scheduled to be in the band this time too, but wasn’t up to it due to a hopefully minor illness. Get well soon Keith. 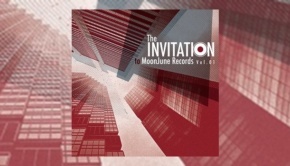 After a slightly tentative beginning with the title track to last year’s superb Burden of Proof album, the band quickly hit the groove, and any disappointment at not seeing Keith Tippett at his piano was quickly forgotten. The smoky blues blowin’ sax from Theo Travis on a greasy and storming version of Pie Chart leads into a soulful solo from John Etheridge that highlights everything I love about his playing. 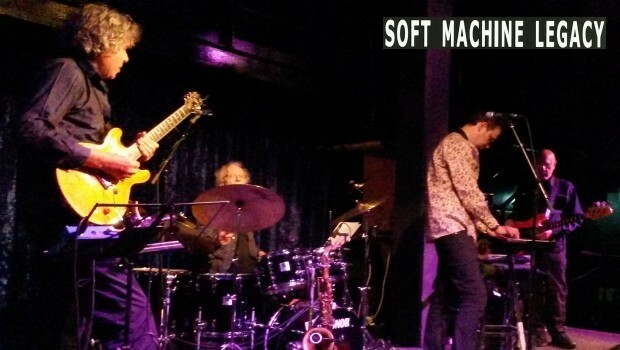 The two guitarists in the later versions of Soft Machine could not be more different; the sometimes over-studious ultra-technical approach of Allan Holdsworth contrasts sharply with the direct emotional hit of John’s playing. Both players have the chops in abundance, but I find John’s more relaxed approach to his instrument far more involving. John Etheridge’s easy going manner also comes through in his between-song banter, talking to the eighty-ish strong audience as if we were a bunch of mates who had popped round his gaff for a cuppa! The set continues with the gorgeous soundscape of Chloe And The Pirates from Soft Machine’s Six, led by Theo’s wonderful flute playing. This leads into my personal favourite SML song in a live setting, the chuggin’ circular riff in 10/4 of Grapehound, a setting that allows John E to fly off hither and thither in the manner of the fusion master that he is. Calming the highly charged atmosphere after that is the semi-improvised combination of Hugh Hopper’s Facelift (from Third) melded into Mike Ratledge’s As If (from Fifth), a heady mix of avant spaciousness that highlights the telepathic understanding of these mostly veteran players. Even “youngster” Theo Travis has been in this band now for eight years! The first part of the set concludes with the effortless funk of Gesolreut (Six), where bassist Roy Babbington nails it to the floor, all the while exchanging glances with drummer John Marshall, the rhythm section tonight is as tight as a nut, as ever. In the band intro John E introduces each member by telling us how long each member has been with the band, including their tenure in the original Soft Machine, which leads to mention of a book on the band describing how at various points they all fell out, a common occurrence in groups, as we know. Later, John looks around at his bandmates as he relates the tale of the group appearing on the Cruise To The Edge, an elitist concept that I have no time for, as I’m sure you know if you’ve read my rantings elsewhere! It would seem from his somewhat ambivalent description of playing alongside the likes of Yes (who were “forced to get on with each other” – heheh…), UK, et al, that SML were something of a fish out of water….sorry couldn’t resist that one! Looking at Theo, John asks “…but, we all had a good time, didn’t we?” Theo answers the question with silence and an enigmatic smile! After a short break, the band get back on stage and commence the second half of the concert with their own Voyage Beyond Seven, a similarly low key introduction to that of the first half, but this time with a cool assurance. This is followed by Kings And Queens from Fourth, as we all pointed out to John E after he introduced it as coming from Third. With a big grin John says “Hell, I don’t know what I’m doing!” and launches into a fine rendition of the highly atmospheric 43 (!) year-old Hugh Hopper classic. This is one song where Keith Tippett’s piano would have added a significant layer, but it is only sitting here listening to a live recording from elsewhere as I type that I make this point; at the time I didn’t notice the absence. The Nodder and Song Of Aeolus follow, both from John E’s brief tenure in the Karl Jenkins’ led Soft Machine, and fine tunes they are too. The Nodder’s languorous riff slowly builds as the tune develops into a masterclass of ensemble playing. Karl Jenkins’ Song Of Aeolus features John E’s most lyrical playing of the night, taking a stroll down the symphonic jazz rock path of that oft ignored and much underrated period of Soft Machine history. Theo’s Relegation Of Pluto-Tarabos-2 Down is the perfect vehicle for extended improvisations from all the band members, including a solo by John Marshall. It was shortly after his 2 Down solo at the last gig that John M collapsed, so it was watched this time round with a mixture of joy at his return, and for obvious reasons no little trepidation by the band’s entourage, and by the members of the audience who were there last time round. We need not have worried, for although his playing was understandably not as intense as previously, that relaxation allowed the subtleties of John M’s vast experience behind a drum kit to shine through. Needless to say, John M’s solo spot got the biggest cheer of the night. The set ends with a stomping version of Pump Room, another from last year’s must have album Burden Of Proof. The band take in the rowdy reception and launch into the encore, an improv entitled Last Day. All in all, we were treated to a fine night’s entertainment, and witnessed a great return for John Marshall, a drummer’s drummer if ever there was one.